Hannah was born in the Midlands in the 1970’s, but she tries not to let this hold her back. Whilst her main role is as a singer songwriter, she also plays guitar, violin, piano and a few other random instruments. 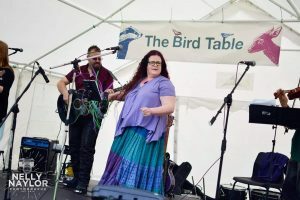 Hannah has previously performed with Village Harmony (a U.S. based international world music choir) and Freedom Hill (a Sheffield based folk duo). Her favorite colour is purple and you can win her favour with gifts of purple things.